Home / News / Blog / An Adieu from Amy! We’re busy moving boxes and clearing out our office today – feel free to give us a hand if you’re passing Zebedee’s Yard – but the Festival still isn’t quite over. A Life in Pictures: The Collected Photographs runs until September 27 at the Brynmor Jones Library at the University of Hull from 10.00am – 5.00pm daily, including Sunday with free admission. If you happen to be venturing to Kent, you can also see the same exhibition until Sunday 16 October at The Seaside Museum at Herne Bay, Tuesday to Sunday 10.00am – 4.00pm (www.theseasidemuseumhernebay.org). Our rather sumptuous coffee table books featuring all the photographs – many publicly previously unseen – are available from Hull Libraries, Waterstones Hull, Hull History Centre, Sewerby Hall and Gardens and by emailing rick@amyjohnsonfestival.co.uk. Hull Central Library is also still hosting our rather marvellous Virtual Amy in the Children’s Library, so go and listen to her stories and become part of this very unique collaboration between Ensemble 52, the University of Hull, ourselves and the technological wizardry of Glasgow School of Art. 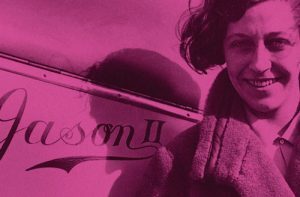 We’ll also be announcing details of the unveiling of the new Amy Johnson statue later this month in Hull, so keep an eye out for that. And of course, there’s always out beautiful Moths keeping an eye on things while we wind down….. Thanks for all your support – and here’s to Amy!